A waste water treatment plant. Waste water treatments usually include a series of physical, chemical and biological processes. 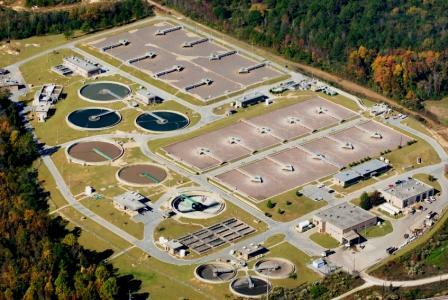 Treated waste water effluent should be disinfected before releasing back to the environment. Effluent disinfection can be done using several different methods and most common ones are chlorine, ozone or ultraviolet (UV) technology. Sludges collected from both primary and secondary sedimentation tank are further treated using digestion technology commonly in an anaerobic environment (without the presence of oxygen). In this process sludge is held inside the digester for 10 to 20 days at around 37 0C to break down and destroy the organic matter of the sludge. This process also creates biogas, mainly a mixture of methane and carbon dioxide gas. Biogas can be used to several beneficial purposes and most common ones are to produce heat, electricity and fuel. The semi-liquid material produce from the digestion process can be dried further and used for different beneficial purposes such as fertilizers, land applications, nutrients recovery etc. or transported to landfill. Go back to the Water Pollution Home! Know more details on waste water treatment here.